It depends how you want to read this one. On one hand, with the advantage in the tie, Inter are content going to Stamford Bridge knowing Chelsea have to beat them to progress. On the other, Chelsea’s away goal could turn out to be vital, and a 1-0 win in the second leg will see them go through. 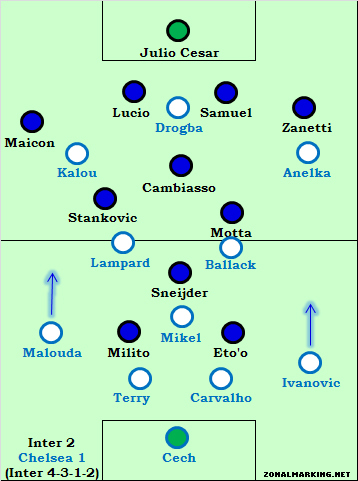 Inter set out with their standard 4-3-1-2 formation, Chelsea went up against them with a fairly standard 4-3-3, with Kalou and Anelka in wide positions, and Mikel in the holding role. Inter’s free man was Esteban Cambiasso, sitting in front of the defence, whilst Chelsea’s spare players were the full-backs. Indeed, the fact that Inter play so narrow meant that Florent Malouda was not tested too much in his unfamiliar left-back role. Maicon’s runs forward were relatively rare, which also helped Malouda. Part of the reason for this is that Javier Zanetti was playing at left-back, rather than his usual role on the right of midfield. When he plays there, Maicon can bomb forward without fear of leaving the defence exposed, as Zanetti covers. This was not the case today, and therefore Malouda was not troubled too much. Essentially the key to the game was Chelsea’s full-backs, and how much they looked to get forward. In the first half they largely stayed at home, perhaps concerned that Inter’s numerical advantage in midfield would result in Wesley Sneijder getting forward unmarked to create a third forward. At half-time, Carlo Ancelotti seemed to give them the green light to go forward, and Ivanovic’s storming run forward almost immediately created the goal, for Kalou. Inter then re-took the lead, through Cambiasso’s run forward. As the free man in the midfield, no-one looked to track his run, and he was afforded two free shots on goal. Then came the game’s defining tactical move – Jose Mourinho withdrawing a midfield player, Thiago Motta, to put on a wide forward, Mario Balotelli. Rather than the attacking move that the ITV commentators insisted it was, it was actually the complete opposite. Although Balotelli is clearly a more attacking player than Motta, it meant that one of the existing strikers moved to the wing, and therefore Inter had two wide players tracking the Chelsea full-backs, who had caused so much danger at the start of the second half. The diagrams on the left show how Chelsea’s full-backs went from free to venture forward, to having a direct opponent to mark. It was essentially defensive in that it looked to stifle the way Chelsea play, and close down the full-backs who had suddenly become so vital. The fact that Mourinho decided to change things immediately after the goal demonstrates the fact that this was a containing move, not an offensive move. And after that, the game was more or less dead. There was no goalmouth incident in the final 20 minutes, because the only ‘free’ players on the pitch, with both sides playing a 4-3-3 system, were a centre-back on either side. Gareth Southgate regarded the switch to 4-3-3 as an ‘attacking gamble which didn’t come off’, but it was anything but. It was a defensive move to close out the game that, as usual with Mourinho’s tactics, worked brilliantly. The game in three weeks’ time will be even more interesting. I think you’re absolutely on point here. Mourinho is one of the best tactitians in the game at adjusting to negate another team’s attack. The other I really admire is Hiddink as he seems flexible enough to adjust to his talent, rather than force players to be out of their comfort zone. Any ideas why Mourinho has largely migrated from his preferred 4-3-3 to the 4-3-1-2 this year? Is it the talent at his disposal or a big difference in formations in Serie A? Hi Ryan, thanks for the comment. I completely agree about Hiddink, he’s a wonderful tactician. The way he set out his side against Barcelona last year was wonderful, Chelsea dominated both games in terms of the number of chances created and were so unlucky not to go through. His use of Essien was particularly great – in one game he’d be holding, in another the one driving at the opposition, and against Barcelona playing a fairly deep right-sided defensive job on Iniesta. Mourinho always seems to switch between 4-3-3 to 4-3-1-2 – at Chelsea he effectively had two systems he flicked between. I remember once away somewhere (Bolton?) he started with Duff and Wright-Phillips wide, and then withdrew both after just half an hour to play another central midfielder and another forward, effectively creating a 4-3-1-2. He always seems to have a frosty relationship with wide players and I think his problems with two expensive signings in wide positions, Mancini and Quaresma, contributed to his shift towards a a 4-3-1-2. But the face he’s got Pandev on board (as well as Balotelli) means he can quite happily switch between, and the players seem comfortable playing either. A friend pointed out this blog only after the second leg, so that’s why this is coming in so late. I have a note to make on your ‘Balotelli was a defensive switch, not an attacking one’. I partly agree and disagree with this. Agree, because it did stifle the full-backs, but disagree, because the intent was not to ‘close down the full-backs’, as you suggest, but simply to exploit the defensive weaknesses of an attacking winger who was forced into an unfamiliar role. And it worked, Balotelli caused all kinds of problems for Malouda, and nearly created a third goal when he played in a low cross and Cambiasso’s attempt was blocked. My point is – Mourinho didn’t make this change just to stifle Chelsea’s play, he knew that since they had scored a precious away goal, we needed more goals. But then again, this is just my PoV, and I know you’ll hold onto yours. But if Mourinho thought that was the best way to attack, he would have made the switch earlier, or done so from the outset. The fact he did it only when Inter went ahead would point to the fact it was a ‘containing’ shape after that, if not a ‘defensive’ one.